We undertake government project to run the tire responsibility for public transportation for a city. We have special capability to design routes, frequency management, trained manpower right from driver to senior management. operate on all the major routes where we have sleeper, semi sleeper coach with video panel for entertainment. We have weekend holidays packages which is conducted by luxury coach. It includes adventure like beaches, hill station, forts, and pilgrimages. Offers great holiday packages in India & abroad for your entire family. From beach resorts to hill station getaways, you get a complete family adventure holiday. Corporate tours where we customized solutions for various MICE (Meetings, Incentives, Conferences and Events). We take responsibility from initial stage of planning including pre-tour familiarization visits, booking of air seats, arranging accommodation at the finest hotels, gala dinners, collateral preparation, technical back up, meal arrangements and event management. India's first Hop on Hop off sightseeing tour service which we have launched in Delhi with Delhi tourism. 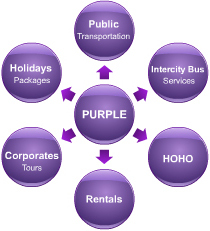 We have 16 low floor Air-conditioned buses which loops around 18 sightseeing places. Car and Bus hire service for individual / corporate. We are committed to provide timely and efficient service which has helped us to widen our loyal customer base. Our fleets are hired for corporate event to family picnics.